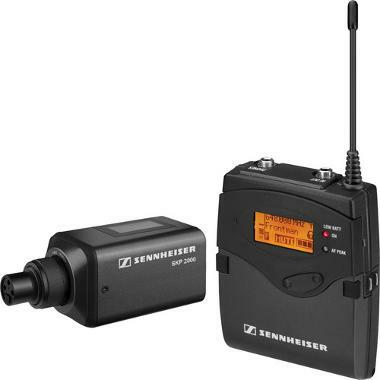 The Sennheiser 2000ENG-SKP Portable Wireless Plug-in System includes a receiver that is designed to receive wireless audio signal from the included SKP 2000 plug-on transmitter. You can scan for available frequencies with the EK 2000 and sync up to the SKP 2000 via infrared. A headphone output is included so that you can monitor your signal and the plug-in transmitter can be paired with any 3-pin XLR microphone so that it can be used wirelessly. This system is ideal for event videographers or to complete a field audio kit to wirelessly receive audio without taking up a lot of space. (4) AA batteries are required to power this lav (2 for the transmitter and 2 for the receiver) and are NOT included in the rental. This system is in the following frequency block: A (516 - 558 MHz). Here is a Frequency Finder for reference.